Setting and atmosphere provide a backdrop for stories and poems, creating a sense of reality that puts readers in the moment. That’s only their most basic function. Skillfully written atmospheric detail also increases tension and drama. In strange places, we think and behave differently than we do in familiar places, where we’re comfortable and we know what to expect. Settings unfamiliar in time or place evoke a similar sense of disrupted balance for characters and for readers. Eric Larson’s riveting book The Devil in the White City, set in Chicago during the 1893 World’s Fair, pits protagonist Daniel Burnham against serial killer Dr. D. H. Holmes. Larson vividly evokes the sights, sounds, and smells of the period, luring us into the underbelly of this unfamiliar world. This tense situation is made even more dramatic by our lack of familiarity with nineteenth century Chicago. This world operates differently than ours, so we never quite know what to expect. In his 2005 film Hostel, Quentin Tarantino uses an unfamiliar place to create dramatic tension. Three college students backpacking in Slovakia, looking for fun and adventure, encounter terror beyond their wildest imagination. In a familiar setting – say, the U.S. or England – where the students knew the language and had a reasonable chance of getting help if they needed it, the story would be less inherently frightening. In Slovakia, even before anything terrible happens, we feel a creepy sense of danger. The kids have absolutely no idea how this world works, or how to survive it; as that reality sinks in, it terrifies them, and it terrifies us. a) Describe a familiar place. Maybe it’s your hometown or your alma mater, your workplace, your favorite city or rural area, the city or town where you live now. Use all five senses to evoke a tangible sense of this place. What makes it unique? Describe the weather, the people, the culture, the environment – the architecture or decor. What language/s do people speak? How do people interact? b) Write a scene set in the place you’ve described. Make the scene active, vibrant – write about a riot, a block party, a festival, a parade. Bring the place to life. c) Think of a person who’d be unfamiliar in this place- someone far younger or older than you or the other characters (a grandmother walking in on a frat house party, for instance), a foreigner who doesn’t speak the language, a city dweller in the backwoods for the first time. 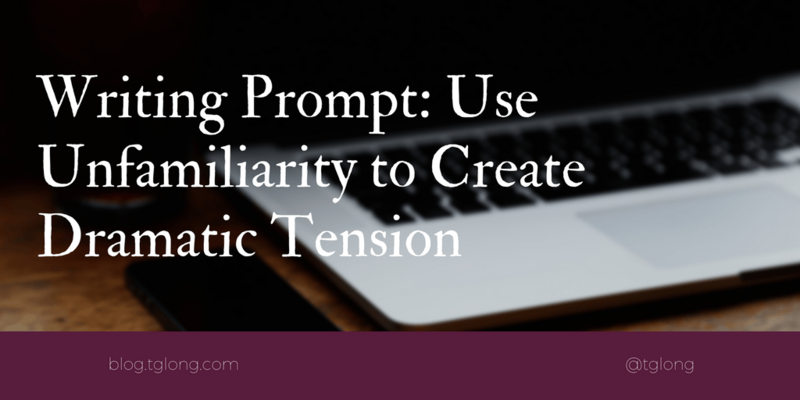 Rewrite a scene from his or her point of view. What changed? How did a lack of familiarity affect the protagonist? Did anything unexpected happen? How might readers interpret and experience the scenes differently? If you’re intrigued, keep writing! See where the story takes you! Thats a useful post, I am not a writer but did struggle with English at school, especially the written side of things. This is one of those things that I am not likely to need to call on very often but it will stick with me and I will look for an opportunity to use it when it presents itself.